Cyclone Idai: What are the immediate dangers? The storm made landfall near the port city of Beira on Thursday 14 March, and the subsequent flood submerged much of the city. But aid agencies warn that other areas continue to be at risk of becoming submerged. That's because it is still raining. Two rivers, including the Buzi, burst their banks after rain in Zimbabwe and Malawi at the weekend, sending even more torrents of water into Mozambique. And more rivers risk bursting their banks, says Rotafina Donco, Oxfam programme manager in Mozambique. She told BBC Newsday that this rain was affecting most of the rivers in Mozambique that flow into the Indian Ocean. She said she expected more casualties. As late as Tuesday, she received information that people in Manica province, near the Zimbabwean border, much further inland from the epicentre of the crisis, Beira, were stranded on rooftops because one of the rivers had burst and the area had become submerged. In Mozambique waters are expected to rise by up to eight metres, putting at least 350,000 people at risk, says the Disaster Emergencies Committee (DEC). A similar situation is playing out in Zimbabwe. Herve Verhoosel, spokesperson for the UN World Food Programme said in a statement that heavy rains in Manicaland and Masvingo provinces continue to cause massive destruction. The Marowanyati dam in Buhera, Manicaland has overflowed, raising river levels, he added. 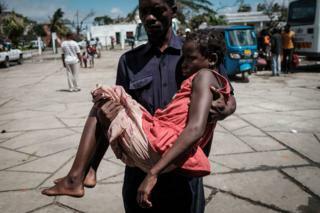 An outbreak of cholera could lead to the death toll increasing exponentially. Cholera is spread through human waste in the water supply. The flood water itself isn't the primary risk. Instead the risk comes because the existing drinking water supplies having been damaged by the flooding. This means people are finding it harder to find safe water. Larger groups of people are also sharing the same water supply, which increases the risk of cholera spreading quickly. "It's bound to rear its head at some point," says Paolo Cernuschi, Zimbabwe Country Director at the International Rescue Committee. But that doesn't mean inevitable disaster. That's because cholera is relatively easy to contain when there is good healthcare available - people just need rehydration salts and to be put on an IV drip, he says. So, Mr Cernuschi says, there is the "race against time" to get the healthcare all set up before an outbreak happens. What's climate change got to do with it? The worst-case scenario is that cholera breaks out in an area that is inaccessible, where there is no health care and spreads, Mr Cernuschi, said. Currently an area his organisation is finding it difficult to access is Zimbabwe's south-eastern town of Chimanimani - making it difficult to tell whether cholera has already begun to spread. Other waterborne diseases like typhoid and malaria also pose a risk, Mr Cernuschi says. Malaria in particular is likely to spread because the aftermath of the flood there is an increase in stagnant water - the preferred breeding ground of mosquitoes that spread malaria. Standing water also creates a risk of diarrheal diseases, Christian Lindmeier of the WHO told Newsday. Even though there is water everywhere it is not safe enough to drink. Access to safe water is vital to prevent any further disease, says Mr Lindmeier. Relief efforts need to deliver clean water or water purification tablets. "Getting there is the biggest challenge," he says. The floods have cut off land routes and the only way to get to people is by air or water. While people may make it through the next few weeks with the energy biscuits and water purification tablets that are currently being airdropped, a more long-term threat of starvation still looms. Mr Cernuschi explains that the cyclone has compounded a crisis that was already there. He says drought in parts of Zimbabwe had already written off an estimated 75% of crops in the areas affected by the cyclone. "Whatever crops that were being grown despite the drought have now been destroyed in the floods," he says. He warns of a food insecurity crisis in the next six to 12 months - when people will face starvation as a result of the cyclone destroying their crops. 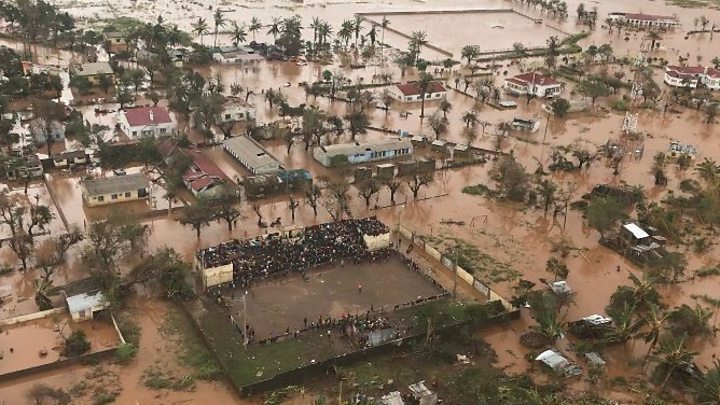 As for the country that is worst hit by the cyclone, Mozambique, a total of 600,000 people are believed to be in need of help, writes Andre Vornic from the World Food Programme. Monica Blagescu, DEC Director of Humanitarian Programmes, warns that if more is not done, a "secondary emergency is approaching rapidly". Cyclone Idai: What's the role of climate change? How long can survivors last under rubble?